This is how I felt today 😉 It’s not dead by the way. I saw this alpaca on my walk today. It sat up to start with but although I tried to beckon it over to me with grass, it just put its head down and went to sleep. I have been brought to a stand still for the second time now within two weeks by sickness. I mean non stop vomiting. Usually when I have a stomach bug there is like a foul taste in my mouth, but twice now I just woke up in the morning and the only thing stopping me from throwing up was lying still. So I spend yesterday and this morning in bed not moving and sleeping, just sleeping like I haven’t slept before. I had an episode of vomiting about three years ago. In that case it was decided that it was caused by stress and worry and I believe that is the case this time as well. I am having quite a stressful time at the moment. On the bright side this is soon going to be resolved hopefully, but my body is reacting quite strongly at the moment. I was meant to be on holiday as well, but a day and a half in bed is also quite restful I guess. Poor you. It is a rotten shame that one’s body waits until there is time off before crashing. 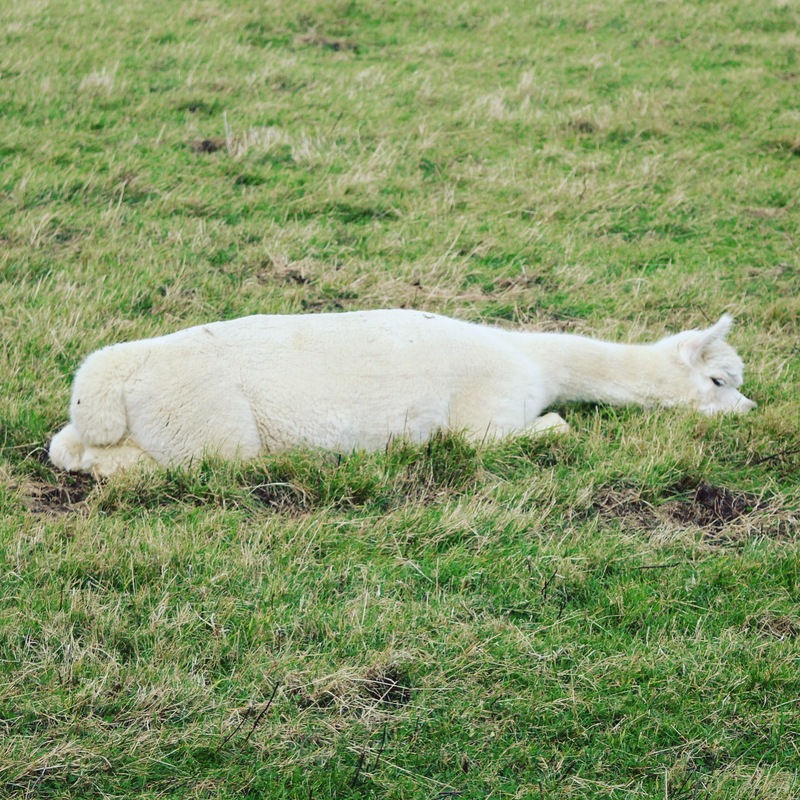 My partner who was a teacher used to make it all the way to half term, or end of term, looking more and more like a worn-out alpaca (yours is so sweet!) and then spend most of the holiday in bed, wiped out. I hope you can get your stressor(s) sorted out soon. I don’t think work is supposed to make you ill! Listen to your body. We all need to rest and perhaps take a nap once in a while. 😉 Speedy recovery.